The Department of Energy in the wake of the whole BP debacle has developed a new social media strategy by launching a blog and a Twitter account to go along with their Facebook andYouTube accounts. I think it is great that a government agency is looking to engage and communicate better with interested citizens. I have taken a closer look at the DOE’s new blog and Twitter channel and while I applaud them for this initial launch, I would like to share five recommendations for how they can do better. You listening DOE? 1. Social media is about creating and developing a two-way conversation. You do not offer commenting on your blog. You could easily moderate comments to ensure nothing goes live you do not want to, but instead, you chose not to offer it. Seriously folks, why create a blog at all? What’s the difference between your blog posts and the press releases you have been churning out since the beginning of time? They are both one-way conversations with you showing very little to no interest in what we (the voters, the taxpayers, you know US!) might have to say. Lesson: You want to educate, inform and engage with us in social media, you have to respect us enough to allow a two-way dialogue. Trust that for every negative comment you might receive, if done right, you will also reach someone you would not have had the opportunity to reach before. 2. Speaking of those press releases, why? You have created a blog to engage with the public and in the top right hand corner above the fold are links to (big exhale and let down) press releases?!?!? The public does NOT read press releases. They are dry, they are boring and they usually offer very little information that a individual user would find interesting. You know who reads press releases, the media. Lesson: Understand who your target audience is. If you want this to be a place for media to get their information, great, but tell us that. Don’t take a one size fits all approach, it does not work. 3. Who are you people? 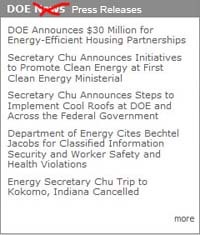 Secretary Chu posted your first blog post, but after that you have all these different people posting for you, names like John Schueler, Scott Blake Harris and David Sandalow. My question is who are these people? I would love to know a little about who is writing these posts. Unfortunately, you do not offer any type of bio’s on these folks. On the bottom of each post, you have tag links that says “Learn more about: David Sandalow”. When I clicked on that, it just took me to a search page of everything he has written. Lesson: Understand that you need to earn your users’ respect if you want to have an impact. That respect begins by properly introducing who these people are and what they are about. Why should I believe what this person is writing when I don’t know who this person is? 4. Social media is all about transparency. Very similar to my last point, on your DOE Twitter page, you have more than one person tweeting, but you are not identifying who these people are. President Obama mentioned a number of times during the campaign and during his tenure as President that his administration would be more transparent. You need to represent accordingly by adding tilde’s ^ to each tweet and add the initials of whomever is tweeting. Lesson: There is nowhere to hide in social media. You need to come out from behind the curtain and be willing to stand up and be heard. If you are not ready to do that, you are not ready to play in these social media waters. 5. Follow people damn it! I am tired of government organizations attempting to play on Twitter, but the only people they follow are other government agencies. Look at your follow list. You don’t have to follow everyone, but if someone writes an interesting blog post that is relevant to the Department of Energy (Like this one!) show that person some respect and follow them. Lesson: Social media is just not about talking, it is about listening. You need to show that you are able and willing to listen to the people who are supposed to matter most to you, your constituents. To my Department of Energy peeps, I am hoping that you are actually listening and have found and read this post. I hope this was helpful and might provide you with some suggestions on how to improve this important and necessary initiative. And if so, I would be tickled pink to hear back from you on any feedback, thoughts or opinions you might have. I look forward to hearing from you.